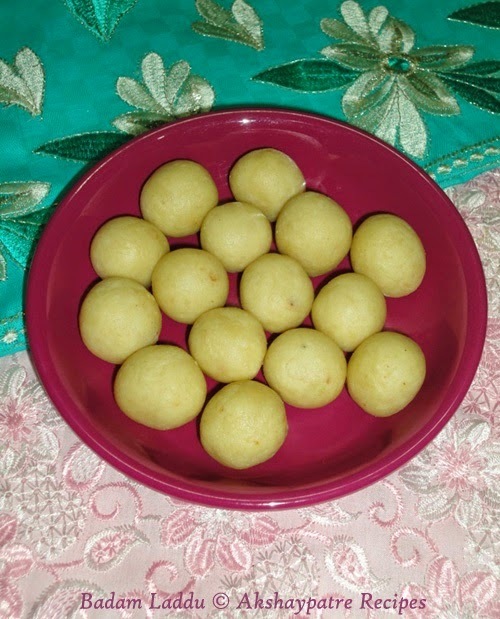 Badam or almond ladoo recipe - Besides traditional Puja and Rituals, Deepavali is meant for food, sweets, snacks, clothes, fun and happiness. Sweets are either bought from shop or homemade, they surely add glitter to the festive mood. For the time being, my kitchen is a small factory, churning out small quantities of various sweets and savouries (Faral). One of them is laddu. Laddus are rich in calories. So, gaining weight is quite possible, after eating it. No matter, we can compensate it later, by reducing to less calories intake to balance the calories. So, let us enjoy eating Deepavali Sweets. The laddu has significant role during Indian festival and special occasions. They gain top priorities among all other sweets. This year I have prepared badam laddu using khava, flavored with cardamom powder. Badam laddu is my family's most favorite laddu. It is so flexible, can be modified according to the personal liking. The quantity of khava can be reduced. This creamy textured badam laddu is an eater friendly sweet, that melts in the mouth. Soak the almonds for 3-4 hours and peel. Grind the peeled almonds to a thick coarse paste similar to fine semolina. Do not use water. Heat a non-stick pan on medium flame. Add milk, ghee and almond paste to it. Stir constantly till the milk combine with the almond paste. Bring it to boil and cook till the almond coarse paste cook well. In the meantime, prepare three thread sugar syrup. Take 1 cup of sugar in a vessel. Add 1/3 cup of water to it. Mix and stir till the sugar completely dissolves. Keep the vessel on a medium flame and bring it to boil. When it starts boiling, remove from flame. Sugar syrup changes it's consistency very fast. Add khava and sugar syrup to the almond mixture. Mix till the sugar syrup combines well with the almond paste. Once the sugar syrup and khava is added, the mixture starts to loosen a bit. Stir constantly to make it thick. When the mixture becomes very thick, add cardamom powder to it. Cook till the mixture becomes a lump. It could be 18-20 mins. At this stage, turning the very thick mixture with single spatula is difficult. Handle it with 2 spatulas, using both hands. Once the mixture turns to lump, remove from flame. When the mixture is warm, make small lemon sized laddus and place them on a flat plate. Once the laddus come to room temperature, store them in an airtight container. It can be stored for 10 days at room temperature. If kept in refrigerator, it can be stored for over a month. Take 1 cup of sugar in a vessel. Add 1/3 cup of water to it. Mix and stir till the sugar completely dissolves. Keep this vessel on medium flame and bring it to boil. When it starts boiling, remove from flame. Sugar syrup changes it's consistency very fast. 1. Soak the almonds for 3-4 hours and peel. Grind the peeled almonds to a thick coarse paste similar to fine semolina. Do not use water. 2. Place a non-stick pan on medium flame. Add milk, ghee and almond paste to it. Stir constantly till the milk combine with the almond paste. Bring it to boil and cook till the almond coarse paste cook well. 3. Take 1 cup of sugar in a vessel. Add 1/3 cup of water to it. Mix and stir till the sugar completely dissolves. Keep this vessel on medium flame and bring it to boil. 4. When it starts boiling, remove from flame. Sugar syrup changes it's consistency very fast. 5. Add khava and sugar syrup to the almond mixture. Mix till the sugar syrup combines well with the almond paste. 6. Once the sugar syrup and khava is added, the mixture starts to loosen a bit. Stir constantly to make it thick. 7. When the mixture becomes very thick, add cardamom powder to it. Cook till the mixture becomes a lump. It could be 18-20 mins. Handle it with 2 spatulas, using both hands, as shown below. 8. Once the mixture turns to lump, remove from flame. 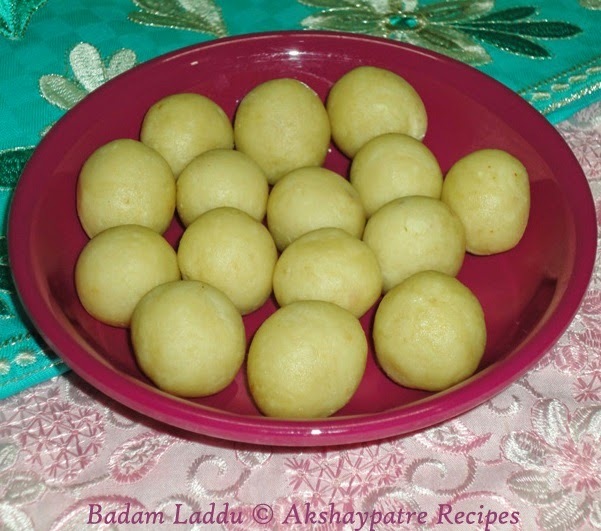 When the mixture is warm, make small lemon sized laddus and place them on a flat plate. 9. Badam laddu can be stored for 10 days at room temperature. If kept in refrigerator, it can be stored for over a month. wow so smooth and delicious looking ladoo's :) looks fabulous ! !